Crispin Guest, the disgraced knight and investigator-for-hire known as the Tracker in London of 1384, is perplexed. How did a man pass away in plain view in a boisterous tavern without anyone knowing, not even Crispin? The mystery deepens when he discovers the deceased was a Knight Templar, an order forcibly disbanded decades earlier. Crispin’s curiosity about the murder leads to run-ins with an old nemesis, Sheriff Wynchecombe – their barbed banter is hilarious – and draws him into a tangled and dangerous web involving the anti-pope’s henchmen, the seductive damosel Lady Vivienne, and a quest for an elusive and ancient cup. Things get unexpectedly personal for him, too. The more involved Crispin gets, the more he’s forced to revisit and re-evaluate events from his past. And then there’s the plucky, ginger-haired Jack Tucker, an 11-year-old boy he catches snipping purses at the tavern. Crispin says he doesn’t need a servant, but Jack’s a smart kid who’s been living on the streets much too long. Crispin is an attractively brooding hero whose sarcastic wit enlivens the narrative. Still unrepentant about the treasonous act against Richard II that cost him his lands and title seven years ago, he’s nonetheless a man of honor who wants to see justice served. And although he’s susceptible to the lavender-scented wiles of Lady Vivienne, his heart remains with a woman he can’t have. The complex, swift-moving plot unfolds against a realistically detailed atmosphere of 14th-century London, from Crispin’s simple residence in the crowded Shambles to the elegant halls of court he once knew well. The setting comes alive with the ringing of church and market bells, mysterious encounters in dark medieval alleyways, and much drinking of wine. 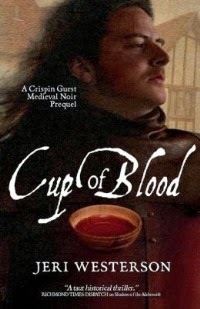 First written over a decade ago, when grails and Templars were popping up around every corner thanks to Dan Brown, Cup of Blood didn’t succeed in finding a publisher then – but an editor at St. Martin’s Press was so intrigued by the characters that he asked to read another novel about them (which became book 1, Veil of Lies). After the six-book series was dropped last year, Westerson dusted off this tale of Crispin and Jack’s first meeting and early adventures, re-edited it, and self-published it as a prequel. It would be hard to improve on this exceptional historical mystery. Whether you’re approaching the Crispin Guest series as a seasoned veteran or as a newcomer, this latest entry is great fun to read. Cup of Blood was published this month by Old London Press in paperback ($13.99, 310pp) and as an e-book ($5.99). Thanks to the author for sending me an e-galley at my request.